I have been "tart" obsessed this month. 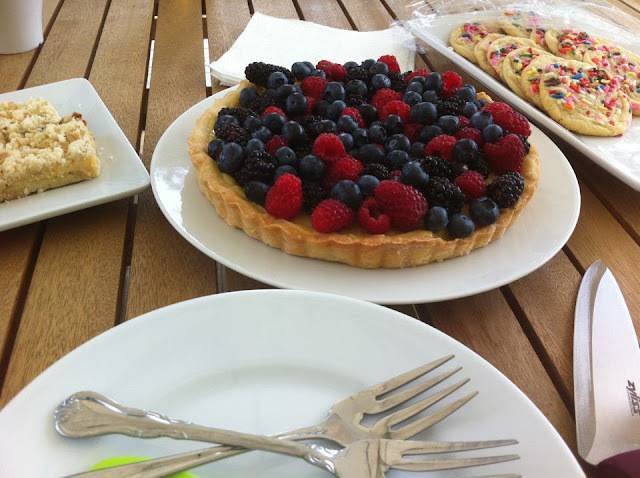 I can't help it, Tarts are such a great summer dessert and I have been trying out lots of new recipes. Unlike the glazed tart where the crust is a sponge cake, this tart has a hard crust and pastry cream filling. Combine the flour, sugar and salt in a small bowl and place in the freezer for 30 minutes. Put the flour in a bowl and cut the butter and shortening in (until the butter is the size of peas) If you have a food processor, use that. Add the ice water and mix well until the dough comes together. Dump on a well-floured surface and form into a disk. Wrap in plastic wrap and chill for at least 30 minutes. Roll the dough to fit in your tart pan. Don't stretch the dough when placing it in the dough, or it will shrink when baking. Cut off the access by rolling the pin across the top of the pan. After 15 minutes remove the foil and prick the bottom of the crust with a fork, and bake for another 15-20 minutes, until lightly browned. Set aside to cool. In the bowl of an electric mixer fitted with the paddle attachment, beat the egg yolks and sugar on medium-high speed for 4 minutes, or until very thick. Reduce speed to low and add the cornstarch. Don't be alarmed when the custard comes to a boil and appears to curdle; switch to a whisk and beat vigorously. Cook, whisking constantly, for another 2 minutes; the custard will come together and become very thick like pudding. Stir in the vanilla, butter and heavy cream. Cool slightly and pour into the baked tart shell. Place plastic wrap directly on the custard and refrigerate until cold. About an hour before serving, wash some strawberries and slice them. 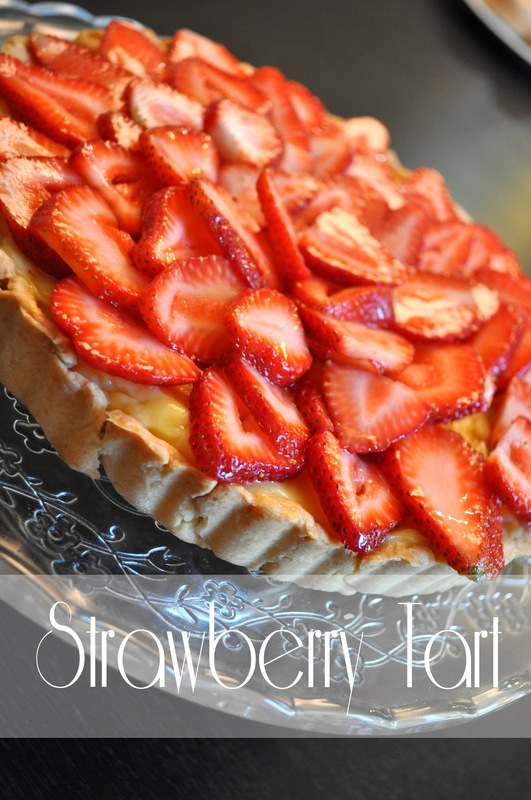 Toss with 1/4 cup of sugar and place around your tart. Just wash and put them on top of the tart. No sugar, the contrast of the sweet/tangy berries plus the sweet pastry cream and flakey crust is amazing. Strawberry tart is looking so delicious.Perfect desert for my little one's birthday party.